BC SPCA > FAQs > Pet care & behaviour > Should I keep my cat indoors? Is unsupervised outdoor time OK? 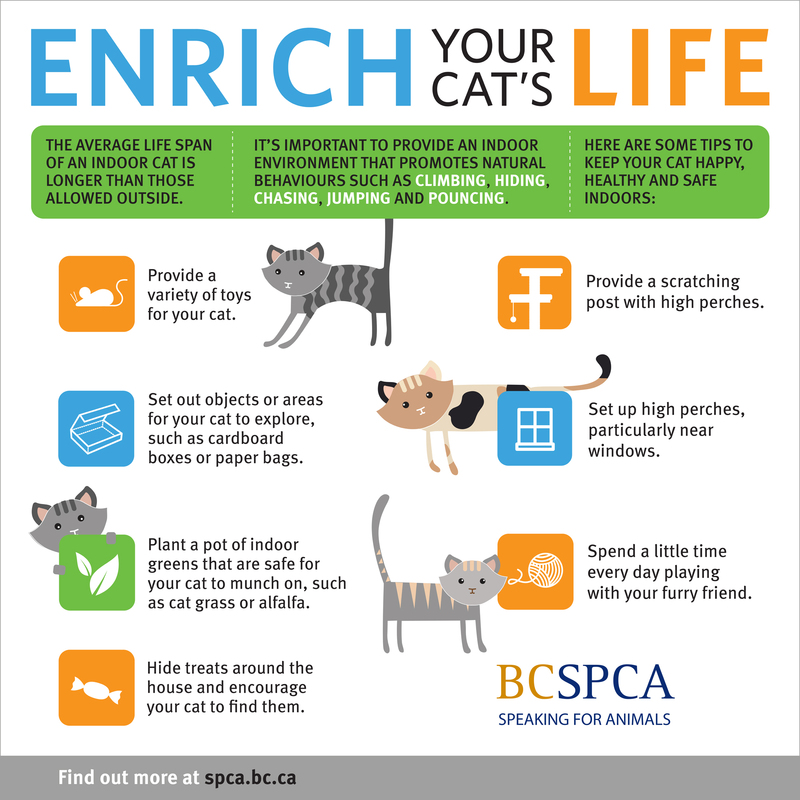 The BC SPCA recommends that cats live indoors. Indoor cats have a longer life span than those that go outside. Whether you choose to let your cat out or keep them in, know how to provide them with the best environment to keep them happy and safe. What’s the issue with indoor and outdoor cats? To prevent these issues, help your cat be a cat. Indoor cats need to do things in their home that let them hide, chase, climb, jump and pounce. Give your cat toys that are safe and stimulating. Use feathery and fake furry toys that move like small prey or toys filled with catnip. Stimulate and engage your cat through play with safe toys. Give your cat a scratching post with high perches. Put it near doorways or window. Spend time every day interacting with your cat. What does your cat like? Play or petting? Play with toys, games of chase and peek-a-boo. Train your cat. Plant a pot of indoor greens for your cat to munch on such as cat grass from seeds (oat, rye, wheat, barley) or catnip. Open screened windows to let fresh air in. Give her access to window ledges to sit on and look out at the world. Cats are auditory hunters. Be creative, get toys that make buzzing noises. Reward your cat when he hunts the sound. Whether inside or out, your cat should always have a collar and ID tag as well as a tattoo or microchip. “Quick-release” or “break-away” collars with elastic are best. They’ll prevent your cat from getting tangled in branches or other objects. Think about all the risks before deciding to let your cat go outside. It might be hard to change her habit of going out if you change your mind and want to keep her in. Train your cat to come back at a certain time every day by feeding her only then. Give your cat access to the inside of the house or a safe shelter near the house to escape other cats or dogs if one is chasing her. Train your cat to respond to a whistle by blowing the whistle every time you feed her or give her a treat. (Be careful as your cat may come running from across the street when she hears the whistle. You should not use the whistle unless you know it is safe). Talk to your vet about vaccines and parasite prevention.